"Curly hair" and "big" hair go hand in hand most of the time. But what about us fine-haired, curlies with a low density head of hair? Most of us would agree that you can never pump up your curly volume enough! Even a lot of ladies with naturally big curly, coily and wavy hair hate it when their manes fall flat. So what's a curly girl to do? As if he heard your curly cry for help from afar, Jonathan Torch has launched the perfect addition to his Curly Hair Solutions collection: RevUp! Volumizing System! This new line transforms your hair from fine and flat to full and fabulous by drastically adding volume, body and bounce. The RevUp! Volumizing System is not just an ordinary volumizing styling product. These innovative products protect hair from becoming weak and breaking, while allowing moisture to penetrate the hair, an essential component for voluminous, bouncy curls that are also healthy and strong. Worried about big frizz that sometimes comes with "big" hair? What curly girl isn't? The RevUp! Volumizing System is also a "humidity control system" in a bottle! No‐silicone, water‐based formula rinses out clean with no product build‐up which is perfect for curlies who co-wash! For maximum volumizing results, smooth on RevUp! Volumizing Shampoo from roots to ends on totally wet hair to keep your hair and scalp healthy and clean. Massage it into your scalp as well. Allow the ingredients to activate for at least 30 seconds, then rinse well and repeat if necessary. To add extreme volume to your hair by defining each curl, spray RevUp! Volumist generously onto dry or wet hair and then scrunch or squeeze into your curls. Allow your hair to air dry or use a diffuser attachment to blow dry and watch the volume appear! There is no wrong way to use RevUp! Volumist! Wondering where you can get your hands on some? The RevUp! Volumizing System, with both the shampoo and the spray together, is available in two sizes, 8 oz. for $39.90 or 2 oz. for $19.50 on frizzoff.com! To find out more about the RevUp! 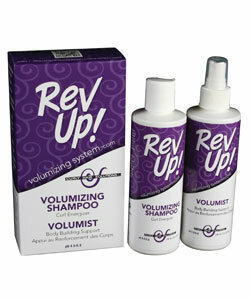 Volumizing System, check out revupvolumizingsystem.com.